Bush’s Mortgage Aid – Too Little Too Late? If you’ve listened to the news at all lately, you’ve probably heard a lot of talk about the effects of the subprime mortgage crisis. In a nutshell, the crisis began last month when many subprime mortgage owners were forced to foreclose on their homes. Many of these homeowners entered into “subprime” mortgages, meaning that the rate they were paying was lower than the market rate, in exchange for higher interest rates down the road. The “adjustable rate mortgages” (ARMs) have a low introductory interest rate, but reset every 5 years or so to the new market rate. Basically, you’re gambling that the rates won’t rise to a point that you won’t be able to keep up. Unfortunately, many people took the grasshopper approach, and didn’t bother preparing for an increase in interest rates. Without the ability to meet the higher mortgage payments, many homeowners were forced to foreclose, with banks taking a bit hit. Some lenders took such a big hit that they were forced to file bankruptcy, forcing the market to “freak out” (yes, that’s a technical term). The blame has already started, of course. Many people blame the lenders for being overly aggressive and lending to anyone who walked through the door. Others blame borrowers (who I think are ultimately to blame) for overstating incomes, or trying too hard to buy a home they couldn’t afford to begin with. Bush said the Federal Housing Administration, a government agency that provides mortgage insurance to borrowers through lenders in the private sector, would soon launch a program called FHA Secure. The program would let homeowners who have good credit histories but can’t afford their current mortgage payments to refinance into mortgages insured by the FHA. Bush also urged Congress to modernize and improve the FHA so more homeowners could qualify for the mortgage insurance provided by the agency. Last year the House passed legislation to modernize FHA, but Congress has not yet sent a bill to the White House. And in one more effort, Bush also pledged to work with Congress to reform a key housing provision of the federal tax code, which will make it easier for homeowners to refinance their mortgages. Under the current rules, if the value of your house declines by $20,000 and your adjustable rate mortgage payments have grown to a level you cannot afford, the bank might modify your mortgage and forgive $20,000 of your loan. But the tax code treats that $20,000 as taxable income. And when your home is losing value and your family is under financial stress, the last thing you need to do is to be hit with higher taxes. But I wonder if this help isn’t too little too late? Has anyone ever seen a mortgage document? It’s like 100 pages long full of legalese and loopholes that practically nobody can understand. In my opinion, a large effort should be put into improving lender education. Let’s get that mortgage document down to 10 pages of plain English, and mandatory education classes for new homeowners. The government wouldn’t have to step in and help refinance homes if people were properly educated and knew that an adjustable rate mortgage is not the best move when buying a $1 million home with a $85k income. But what do you think? Has the government done enough? Should they do more? It’s definitely too little, but it isn’t too late. I fully support the elimination of taxation for “forgiveness,” but don’t believe it is the federal government’s responsibility to bail people out of their debts (or to make it easier to get there). A clear and concise mortgage document would definitely be a step in the right direction. Maybe part of the disclosure document should include a brief schedule showing what could happen to a payment if interest rates rise. Regardless, many people will continue to use lower interest ARMs to buy more house and risk getting over-extended. I love that idea Greg! I think similar “scare tactics” might help get the point across. WOW, I wish I never EVER heard of the term “re-finance”. I was fine with my 1100$ mortgage and gave into the “tap into your equity for improvements and cash back”… Lesson learned! 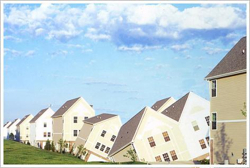 ARM loan or LEG loan don’t ever refinance your home unless you want to pay these consequences! I blame myself and will deal with it myself but I don’t need the government to help me! They squander money just fine without me. The banks are really hurting now, dont re-finance do some over-time instead.